Since Beckett began confusing and astounding generations of critics and theatre goers with such peculiarities as Waiting for Godot, Endgame and Krapp’s Last Tape, silence, repetition and the awkward moment have been recognized as among the most effective theatrical tools. Most sophisticated theatre goers have encountered the famous “Pinter pause“. David Mamet built a reputation writing stage characters who often stammered or left sentences unfinished. Nevertheless, most plays avoid silence and awkward language like the plague. Most characters on the stage are more articulate than life, and most of the time that’s fine. Linguistic eloquence has been the heart of our stage tradition since Shakespeare. Few theatre lovers would reject the witty language comedies of Oscar Wilde, Noel Coward or George Bernard Shaw or the richly articulated dramas of Arthur Miller or Tennessee Williams. But mastery of silence has its place, and nobody in the contemporary theatre has more brilliantly explored the possibilities than Annie Baker. Ms. Baker has attracted international attention with The Vermont Plays, set in the fictional New England town of Shirley, Vermont. The Bay area has been privileged to host outstanding productions of three of the four plays over the past year. First there was Aurora Theatre’s production of Body Awareness, then the fantastically brilliant and unforgettable production of The Aliens at SF Playhouse, and now a lovely rendition of Circle Mirror Transformation at Marin Theatre Company. The play is as straightforward and true to life as anything you are ever likely to see on the stage. In a small town, a group of students gather at the community center to take an acting class. 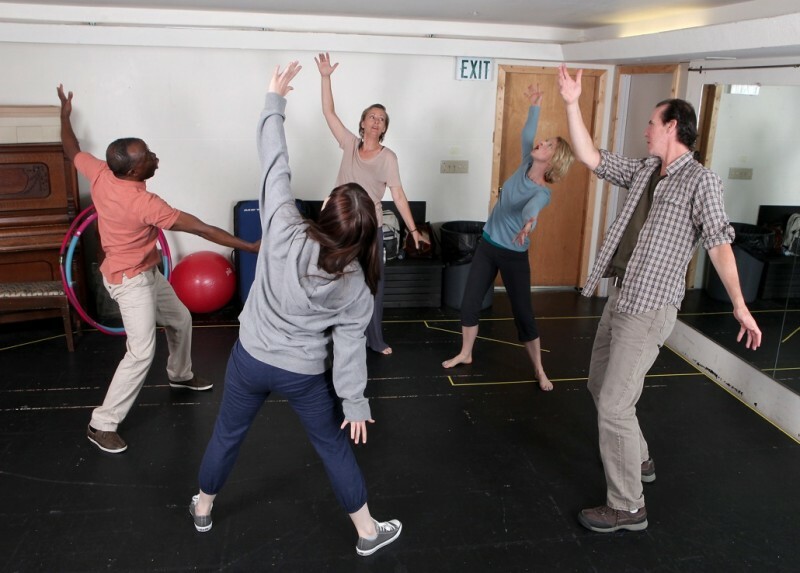 Much of the play passes in real time as the small group performs actual training exercises for actors. They lie on the floor in silence. They stand in a circle and take turns making animal noises and imitating each other. They interview one another and then tell each other’s stories to the group. They are awkward, hesitant, embarrassed and distracted just like real life. There are no plot complications, no sudden bursts of conflict, no surprises. They are just trying to get through the night. During the class breaks, they fall in and out of love, process family problems, argue, stretch, get bored, try to master the hula hoop. After six weeks of class, they are done. Julia Brothers, Arwen Anderson, Robert Parsons, Marissa Keltie and L. Peter Callander perform an acting exercise in Marin Theatre Company’s production of Annie Baker’s Circle Mirror Transformation. Photo Credit: Marin Theatre Company. A play like this makes an unusual, almost impossible demand upon the actors: they must not act. Any note of phoniness would ruin the effect. When they are lying on the floor in silence as they might in an actual acting class, they must do just that and nothing more. In front of an audience. Exposed. That kind of simplicity is the result of great artistry, like Picasso’s astonishingly simple and perfect abstractions of bulls or a melody by Gershwin or Beethoven that repeats a single note or phrase over and over and over and over again (such as Gershwin’s Lady Be Good or the opening of Beethoven’s Symphony #5). Beethoven? Gershwin? Piccasso? That’s heady company, but it is impossible to talk about Annie Baker without referring to greatness. She’s that good. The small ensemble (only five actors) does a wonderful job with this piece, under the careful direction of Kip Fagan. Each actor has exceptional moments. Robert Parsons as the lonely, middle-aged and sensitive Schultz is as vulnerable as a soap bubble. L. Peter Callander’s James shows layer after layer of characterization over the course of the play. Julia Brothers is touching and goofy as the acting teacher. Arwen Anderson and Marissa Keltie round out the cast with fine characterizations of a man eating New York actress and an angry adolescent. Work like this is why we go to the theatre. Circle Mirror Transformation continues at the Marin Theatre Company through September 2. For further information, click here. “Circle Mirror Transformation” by Annie Baker, co-produced by Marin Theatre Company and Encore Theatre Company. Director: Kip Fagan. Scenic Designer: Andrew Boyce. Lighting Designer: Gabe Maxson. Costume Designer: Christine Cook. Composer & Sound Designer: Cliff Caruthers. Properties Artisan: Susan Helday. Theresa: Arwen Anderson. James: L. Peter Callender. Lauren: Marissa Keltie. Schultz: Robert Parsons. Marty: Julia Brothers. Posted in Reviews.Tagged Arwen Anderson, Circle Mirror Transformation, Encore Theatre Company, Julia Brothers, Kip Fagan, L. Peter Callender, Marin Theatre Company, Marissa Keltie, Robert Parsons, San Francisco theater reviews.